You may not want to order take-out after having a batch of these little chicken pieces because these are incredibly delicious. This sauce is not overly spicy and the sugar and honey balance out the soy sauce wonderfully. You will not even detect any honey in these and there is no huge list of ingredients for the sauce. 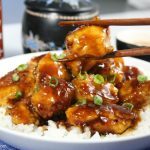 The sweet ginger garlic seasoning used for this recipe has a blend of sesame seeds, garlic and ginger so if you’re not able to find this particular seasoning blend, no worries just substitute 1/2 tsp of garlic powder, 1/2 tsp ground ginger and 1 tsp of sesame seeds for the seasoning. Add more sriracha sauce to your liking and enjoy! 1. In a shallow bowl whisk together the sauce ingredients except for the left over cornstarch mixture and set aside. 2. Place 1/2 cup of cornstarch into a big zip-loc bag and add the chicken chunks; shake to coat. 3. Whisk the other half of cornstarch with 1/2 tsp of baking powder and water. 4. Heat oil in a small wok over medium-high heat. Dip the coated chicken pieces in the cornstarch batter and fry the chicken chunks in small batches, reserving the batter mixture. 5. Once chicken pieces are fried, wipe clean the wok and add the sauce. Stir over medium heat until the sugar dissolves (about 3 min). Then add 2 teaspoons of the left over corn starch batter and simmer until sauce slightly thickens. 6. Add fried chicken pieces to the sauce and toss to coat. Remove from heat and serve. In a shallow bowl whisk together the sauce ingredients except for the left over cornstarch mixture and set aside. Place 1/2 cup of cornstarch into a big zip-loc bag and add the chicken chunks; shake to coat. Whisk the other half of cornstarch with 1/2 tsp of baking powder and water. Heat oil in a small wok over medium-high heat. Dip the coated chicken pieces in the cornstarch batter and fry the chicken chunks in small batches, reserving the batter mixture. Once chicken pieces are fried, wipe clean the wok and add the sauce. Stir over medium heat until the sugar dissolves (about 3 min). Then add 2 teaspoons of the left over corn starch batter and simmer until sauce slightly thickens. Add fried chicken pieces to the sauce and toss to coat. Remove from heat and serve. Can I use less sriracha sauce if I dont like too spicy? You could but that could jeopardize the taste. The recipe is only calling for 2 1/2 teaspoons along with other ingredients so it shouldn’t be overly spicy but if you can’t tolerate spicy perhaps reduce the sriracha to a teaspoon and a half?